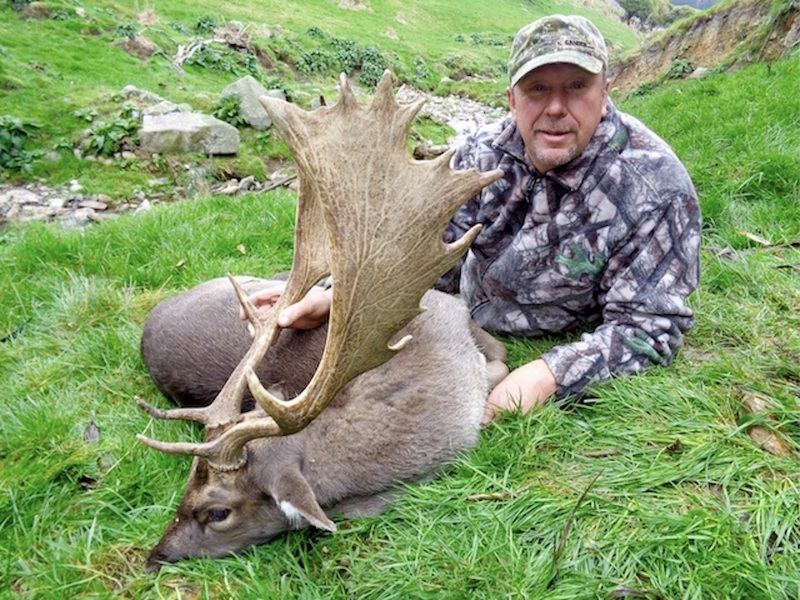 Looking for an incredible Fallow Buck hunt in New Zealand with good opportunity to take a massive deer? We have some of the best Fallow Deer hunting on foot available in the country. Why should I hunt Fallow Deer with you? 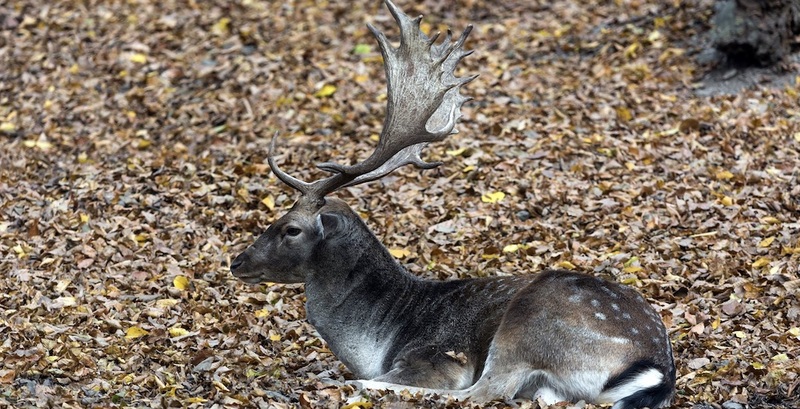 With their impressive palmate antlers, Fallow Deer bucks are a popular animal for deer hunters all over the world. Originally introduced by European settlers, Fallow Deer populations have absolutely exploded in New Zealand and the country is now known as a premier destination for Fallow Deer hunting. We have exclusive hunting rights on several massive sections of private land near the Southern Alps on New Zealand’s South Island containing outstanding Fallow Deer habitat. For that reason, we offer some of the best Fallow Deer hunting in the country. Since we have exclusive access to such a large amount of outstanding Fallow Deer habitat on private land, we are able to keep the hunting pressure on the deer very low. Our hunting areas also have very good road access, which allows us to cater to hunters with a wide range of abilities. We also offer the opportunity to combine a Fallow Deer hunt with a Red Stag hunt. As a result, we have very high success rates on our Fallow Deer hunts on foot and offer a truly world class Fallow Deer hunting experience that few other hunting outfitters can match. Over the past three years, we have a 95% success rate on our Fallow Deer hunts. Not only do we have high success rates on our Fallow Deer hunts, but due to the high Fallow Deer populations, great habitat, exceptional trophy quality of the deer population, and the fact that we keep the hunting pressure very low, our hunters can be very selective and only harvest mature, and often record book quality Fallow Deer. It’s not uncommon for our hunters to see 100 or more Fallow Deer in large groups each day. At the same time, the Fallow Deer population in the area has genetics superior to what you’ll find in many other parts of the world. Not only do the deer there grow exceptionally large antlers, but the they come in a variety of color phases. Our hunting areas are also home to Fallow Deer in all the basic colors, so our hunters have the option of going after a traditional spotted fallow as well as a white fallow or a chocolate fallow. Check out the photo gallery at the bottom of the page to see what we mean. Due to all of these factors, we offer an incredible Fallow Deer hunting experience that is truly in a league of its own. Have you always dreamed of taking a hunting trip in the breathtaking high country of New Zealand? Are you an antler lover who is looking looking for a world class hunt for Fallow Deer and Red Stag? Then book one of our outstanding Fallow Deer hunting packages. 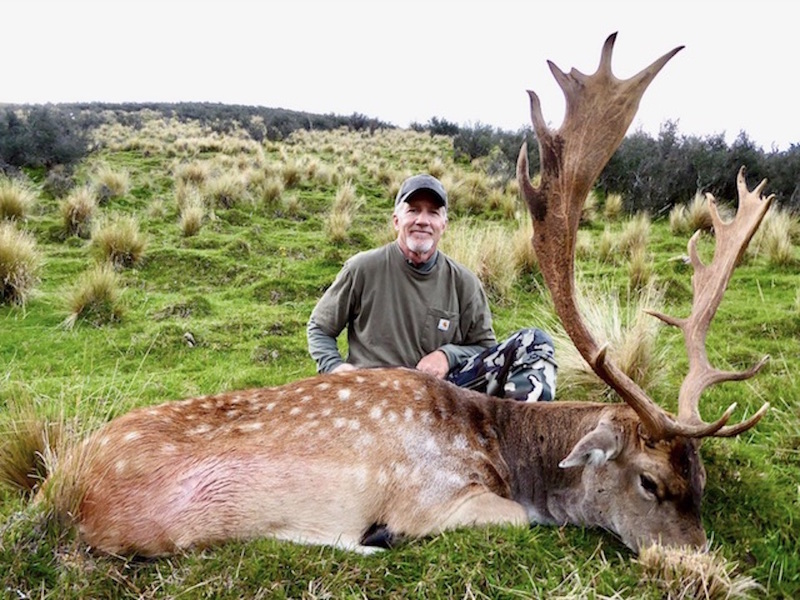 Continue reading to learn more about our incredible Fallow hunting in New Zealand. Please note: we only offer Fallow Deer in conjunction with New Zealand hunting trips for other species like Himalayan Tahr, Elk, or Red Stag. The Fallow Deer hunting packages listed below are valid for hunts booked in 2019 and 2020. All of these packages may be upgraded with additional hunting days and/or big game animals at our normal daily rates and trophy fees listed below. You’ll be at a premier hunting destination in the South Pacific with lots of opportunity to hunt other world class trophy animals You’re also welcome to hunt Arapawa Ram, Merriam’s Turkey, Feral Goats, Whitetail Deer, and Wild Boar on a trophy fee basis. We can also arrange a trip to the North Island (which is just a short, 1.5 hour scenic flight away) to hunt Rusa, Sambar, and/or Sika Deer, so you can experience hunting on both the North and South Islands of New Zealand on the same trip. The same goes for combining a hunt for trophy fallow buck with a water buffalo hunt in Australia. We guarantee a reasonable shot on our Fallow Deer hunts and our lifetime success rate on our Fallow Deer hunting packages is over 95%. However, if you do not take a Fallow Buck (or any species listed in a package) on your hunt, you will receive a $3,000 refund per species not taken. Though every effort will be made to follow up and recover wounded animals, all animals wounded and not recovered will be charged full price. We have scoped and suppressed rifles available for hunters who do not wish to bring their own rifles. For $100, we provide use of the rifle and appropriate ammunition for hunting Fallow Deer. Why Should I Book A Fallow Deer Hunting Trip With You? We have exclusive hunting rights to private private property containing some of the best hunting for Fallow Deer in New Zealand. This area is home to some outstanding habitat as well as a very healthy Fallow herd. For that reason, we have some excellent hunting opportunities that few other hunting outfitters in Europe, Argentina, North America, or elsewhere in New Zealand can rival. We book a limited number of hunts each year, abide by strict quotas, and carefully manage our hunting areas. This ensures that our hunters have high success rates and consistently harvest mature bucks with impressive palmated antlers on our Fallow hunts. You can hunt trophy Fallow Deer with us as an add-on to one of our other hunts for less than what you’d pay on an exotic hunting ranch in Texas. We are not a high turnover outfit. Instead, we focus on providing quality hunts with the best possible experience for each guest. For that reason, we only book one hunt at a time. Instead of sharing the area with people that you don’t know, you’ll have the whole place to yourself. This allows us to give you our full attention and ensure that you receive VIP treatment on your hunt. The hunting lodge is centrally located in the South Canterbury region of the South Island between 5 and 40 minutes of all our hunting areas. This allows our guests to spend the maximum amount of their valuable time in New Zealand hunting without wasting valuable time driving. No hidden costs: our New Zealand Fallow Deer packages include everything except for your air fare, taxidermy, and shipment of your trophies. Our Hunting Guides are friendly, knowledgeable, and have many years worth of experience guiding Fallow Deer hunts. 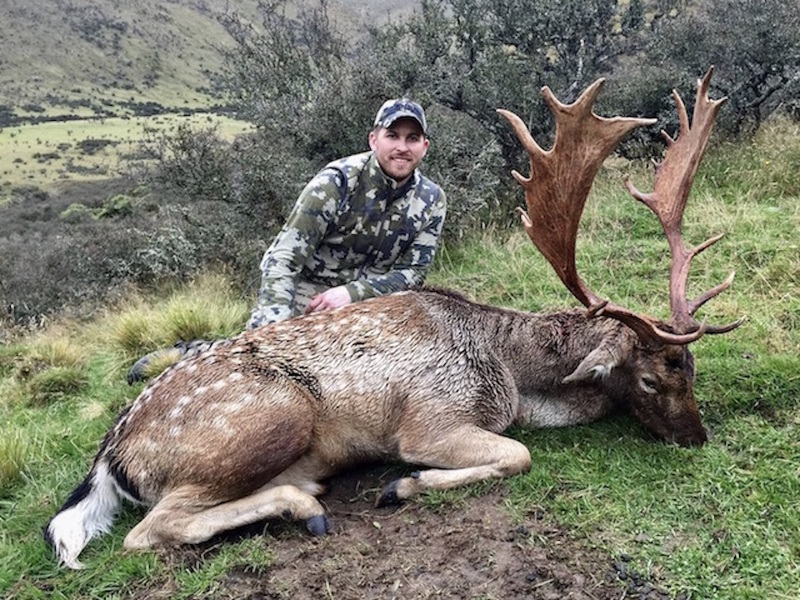 We take pride in providing authentic New Zealand safaris for Fallow Deer with outstanding personal service before, during, and after your hunt. You will not have problems getting in touch us when and we’ll be available to you through the entire process to provide assistance with anything you need related to the hunt. We offer a family friendly New Zealand trophy hunting experience with a wide range of local non-hunting activities and sightseeing tours, so you’re welcome to bring a non-hunting companion with you. We are situated near the famous Mount Cook National Park and numerous lakes in the central South Island. Hunters will stay in our well apportioned hunting lodge located between 5 and 40 minutes from our various hunting areas in the central South Island of New Zealand. With individual rooms, wifi internet, a communal dining room, an outdoor fireplace, and a miniature golf course the hunting lodge is the perfect location to relax after a hard day of Fallow Deer hunting. The accommodations are also perfect for non-hunting guests who want to come along to see some of the most beautiful places in the world and experience many of the other great things New Zealand has to offer. Though the majority of our hunters are from the United States or Canada, hunters from all over the world appreciate our good old fashioned Kiwi hospitality. 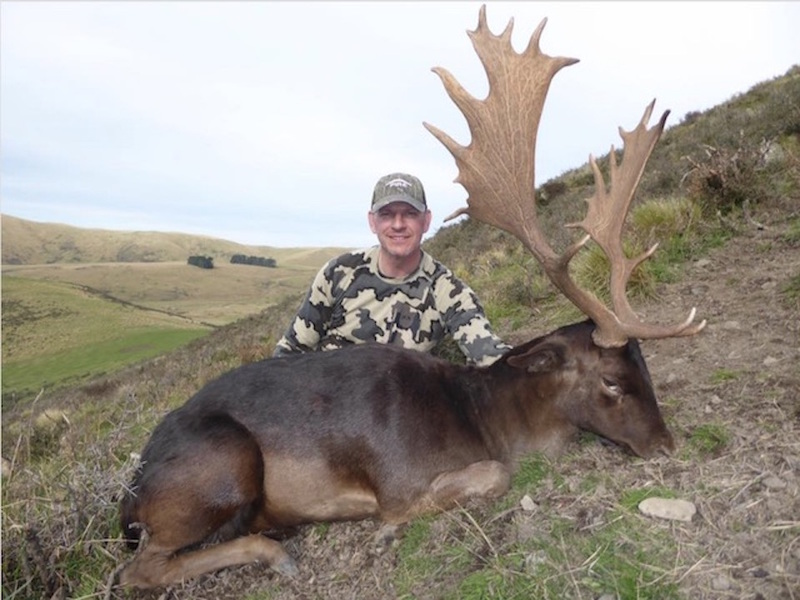 While New Zealand does not have an official Fallow Deer hunting season and there are (no seasonal restrictions and hunting license required), we conduct our Fallow Buck hunts each year from March through September. However, similar to the other deer species present in New Zealand like Red Deer and Elk, the New Zealand Fallow Deer rut begins in early April and runs through the end of May. For that reason, that time of the year is ideal for hunting Fallow Deer, particularly if you want to hunt during the rut and have the best opportunity to take a Red Deer as well. Additionally, our early season hunts in March prior to the rut are also fantastic. This is because those first few hunters of the year are pursuing animals that haven’t been pressured in several months. Though the Fallow Deer aren’t rutting at that time of year, our early season hunts have similar success rates and hunters typically take Fallow Deer of about the same size class as during the rut. Fallow Deer (scientific name Dama Dama) are not very large or particularly tough animals. However, since they are most often hunted in conjunction with larger and/or tougher animals like Red Stag, Elk, and Tahr, most of our Fallow Deer hunters use cartridges like the .270 Winchester, 7mm Remington Magnum, .30-06 Springfield, and the .300 Winchester Magnum. They can also be very shy, so you need to make the most out of the shot opportunities you get when Fallow Deer hunting. For this reason, we highly recommend bringing a rifle that you are familiar with and shoot accurately, even if it is chambered in a smaller caliber. Be prepared to take a shot in the 50-250 yard range. If you’d like to go Fallow Deer hunting in New Zealand, please contact us for more information or fill out the form below. We’ll get back to you as soon as possible, usually within 24 hours. What Hunt Are You Interested In? Subscribe to our newsletter to hear about our cancellation hunts and other special offers.